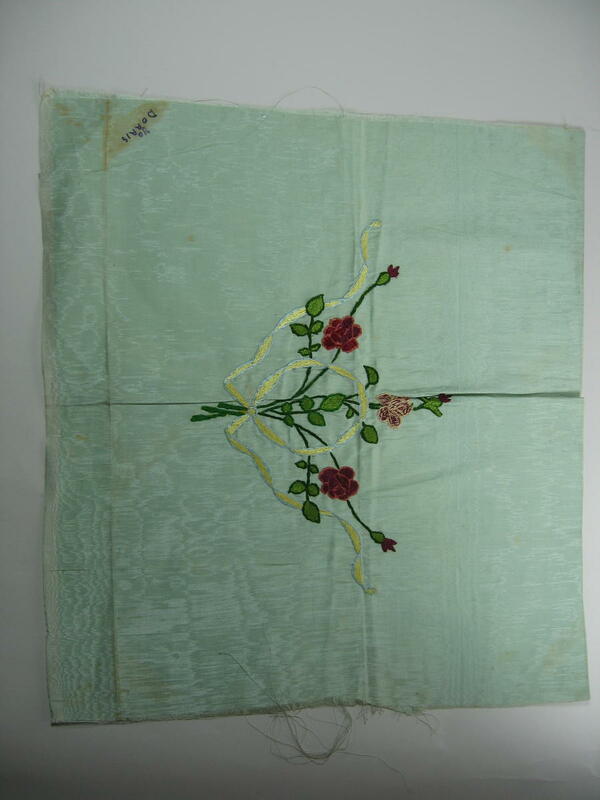 Rectangular piece of green silk decorated with embroidered red roses and yellow ribbon. The words 'To Dorris' are written in one corner. Rectangular piece of green silk decorated with embroidered red roses and yellow ribbon. The words 'To Dorris' are written in one corner. One of a series of items made by amputee convalescing soldiers and given to Miss Doris Wragg (mother of donor) who visited and took out the soldiers from Waverley Abbey Hospital, Farnham in Surrey. Doris Wragg address at the time was Parkwood Springs, Sheffield.